Photograph of Nawab Sardar Khan's Mosque, on the Jamalpur road at Ahmadabad in Gujarat, taken by Henry Cousens in the 1880s, from the Archaeological Survey of Western India. 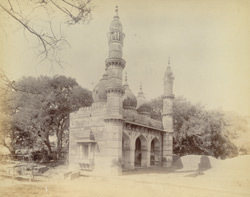 The mosque and tomb stand east of the Jamalpur road. The mosque is a small brick structure on a platform with three pointed arches along the facade. There are two minarets on either side of the facade with four storeys; the lower ones are octagonal and upper part circular. The roof is surmounted by three onion-shaped domes.